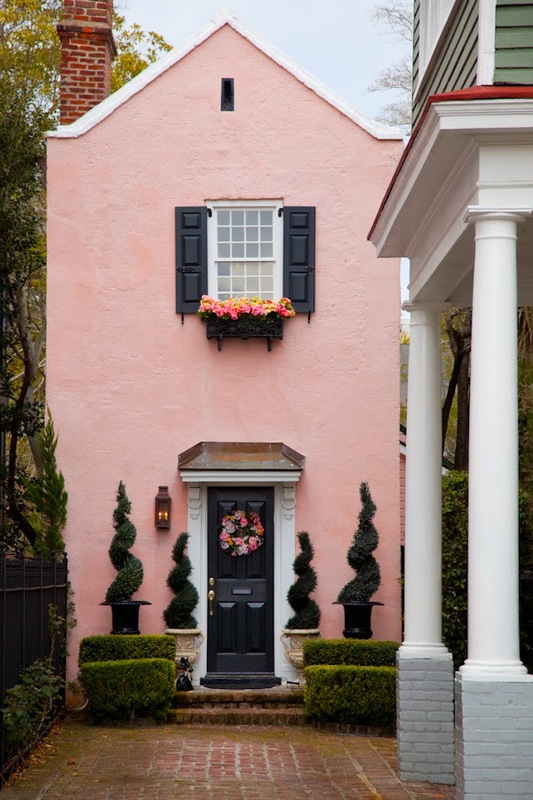 Design Addict Mom: Feng Shui and The Front Entrance. Feng Shui and The Front Entrance. If you've been a long time reader of this blog, then you know about my love affair with Feng Shui. Back in 2013, I wrote a couple of Feng Shui laden posts(sort of a series) and this post could be considered as an installment to that series. 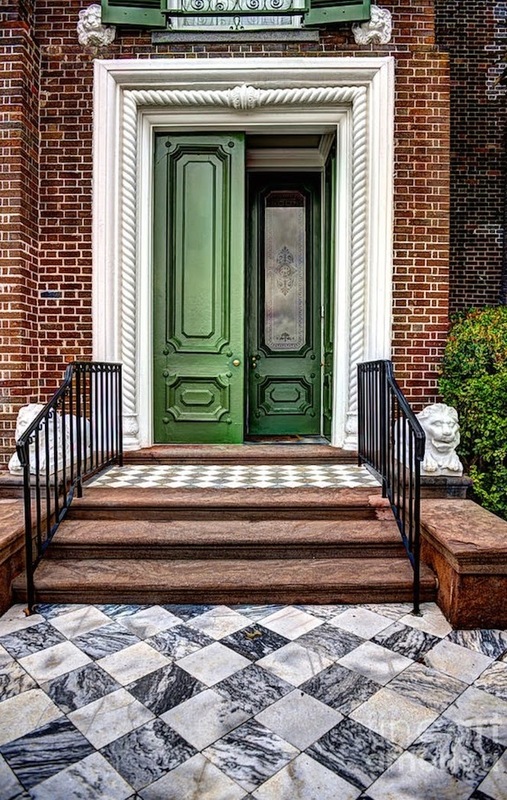 In Feng Shui, how we treat our front entrances can either stunt or enable the flow of positive energy, health, prosperity, abundance, and tranquility in our homes and lives. 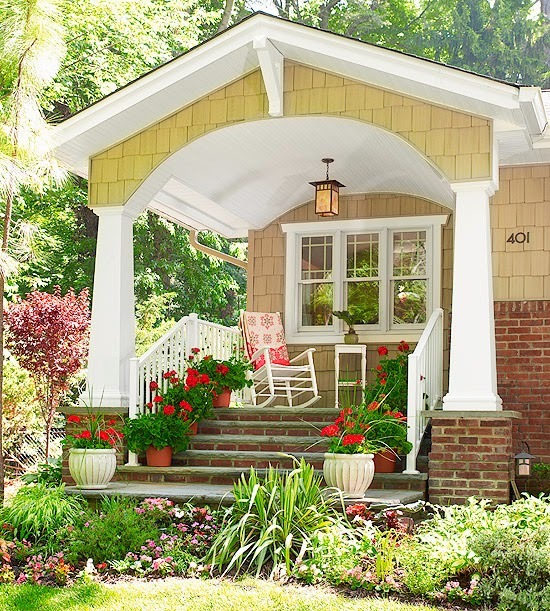 The book Feng Shui Your Life by Jayme Barrett offers enlightening information on how to "Feng Shui Your Front Entrance." It was my source for the 2013 series and will be for today's post. The first step is to create a clear, open, and beautiful entrance for energy to move through and to circulate in your home. Feng Shui promotes the belief that your golden opportunities come in through the front door. The entrance above is a lovely example. The architectural hard edges are softened with the ivy growing upwards. The flowers also provide a welcoming show of color. 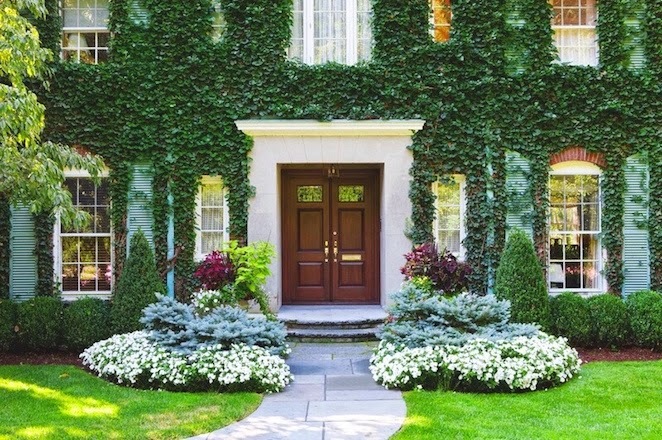 Abundant foliage in the front yard is a natural solution for diffusing negative energy coming towards the door. 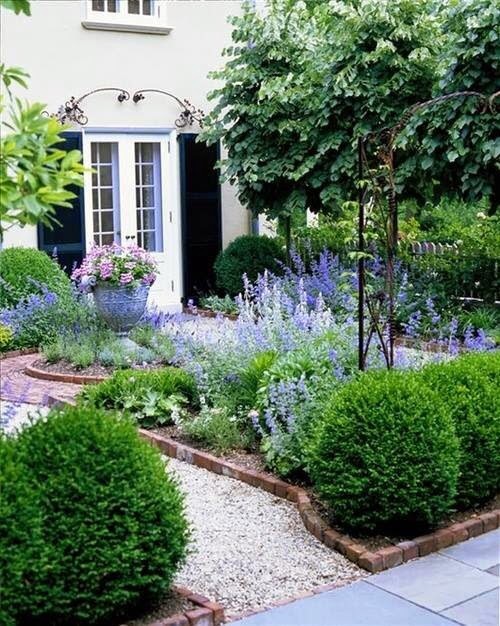 In all other instances, keep trees and shrubs well trimmed so they do not block positive energy entering the home. If you have the space for it, Feng Shui expert Jayme Barrett advises that placing chairs on your front porch both symbolically and practically invites your guests to feel at home. 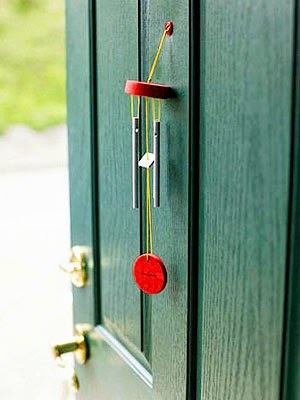 Placing a wind chime outside your door promotes good luck and good fortune while redirecting negative energy. Trees add stability, healing, and vibrant energy to the home. Keep plants and shrubs well manicured. Your entrance should offer a welcome embrace to you and beckon on in positive energy filled with unlimited opportunities. Good morning Stacey! WHAT FABULOUS HOMES and gardens....oh yes, I am totally into this! There is certainly a mood, feeling and even psychology to good design. It affects me, that is for sure. Certain colors and even how much is in a room can make me either feel at peace or too anxious! These are peaceful images here for sure. Thank you my sweet friend for coming to visit my last post. I am still in Blogland VISITING my favorite blogs, and I cannot tell you how it is so LIBERATING for me to finally shift all the time I spent on finding photos, music and writing for my blog over to devoting time to my poetry. My plan is this: to self-publish my blog content, but that will be a huge labor of love because I can't use all the Pinterest photos I've used. I am also taking a risk doing that since most of the popularity of my blog was based on all the photos I used. But I hope to revise my better posts and use my own photography. That means, I will really need to improve!!!!!! This is just in time. Yesterday I planted 6 azalea bushes and though I needed more balance or just more in my front yard. I will see how I can incorporate some of these ideas. Thank you for these Feng Shui advices, they are really helpful. Thank you so much for these tips! Now I understand both the aesthetic and feng shuit reasons for wind chimes! I also love the idea of having an inviting chair as well - how welcoming! Absolutely love these Feng Shui posts of yours Stacey! This is a very interesting post. I recently moved from a home I had a Feng Shui expert consult, to a run down remodel. I've ripped out the creepy landscape and have redirected the walkway all the way to the front door. The timing of this couldn't have been better. I'm looking forward to following you and hoping you'll post more on Feng Shui. My front door is in need of serious work in order to upgrade the path leading to it and make it open and inviting. It's currently blocked by railing (big nono that). Happily, it is painted the perfect color for its orientation.